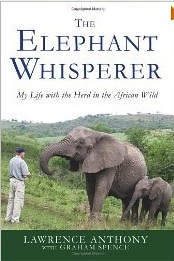 Lawrence Anthony - "The Elephant Whisperer": Lawrence Anthony - "The Elephant Whisperer"
Lawrence Anthony - "The Elephant Whisperer"
Anthony, conservationist and author (BabylonÕs Ark, 2007), owns a wildlife reserve in the KwaZulu-Natal province of South Africa. A former hunting preserve, rumored to be part of the legendary ShakaÕs exclusive hunting territory, it has become a game reserve with a lodge for ecotourists. Home to ZululandÕs full suite of wildlife, Thula Thula had everythingÑexcept elephants. When he was offered a herd from another game reserve Anthony accepted wholeheartedly, despite the fact that these elephants were known escape artists. Lawrence talks to me via Skype from the dark in South Africa. An amazing man! This video has been rotated and formatted to fit a non smart-phone screen, it is best viewed in the free Big App Show app.